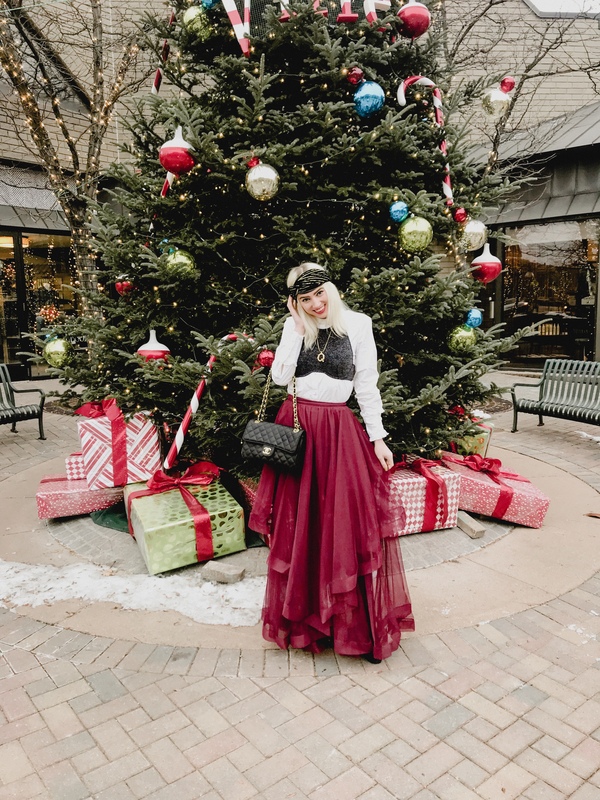 No matter your age, tulle should always be a part of your wardrobe. The full princess-like skirt always adds a little whimsical pep to my step. I love to dress up when the holidays come around. Christmas trees are not the only things that get to be dressed up during this time! This look was inspired by a mixture of things that I had seen on Pinterest and Instagram. Being home in Minnesota for the holidays is always a great break from the constant movement and noise in NYC. Falling asleep without the sound of honking is truly a blessing. Of course, my dad gave me a look before I walked out of the house wearing this, but I am used to him thinking that my wardrobe is crazy. I also loved adding a personal touch to this look with my Q necklace. This bamboo letter necklace is from Bri Kel. We went down to 50th and France in Edina to shoot by the beautiful giant tree and candy canes.